Not keen on Brussels sprouts? It all depends how they are cooked! Wash the chicken legs and pat them dry. Season them well with salt or Herbamare. Heat one tablespoon of ghee in a frying pan and add the chicken legs. Cook them until they are browned and crispy on both sides. Remove the chicken legs from the pan. Add another tablespoon of ghee to the pan and then add the chopped Brussels sprouts. Cook them for approximately 3 minutes. 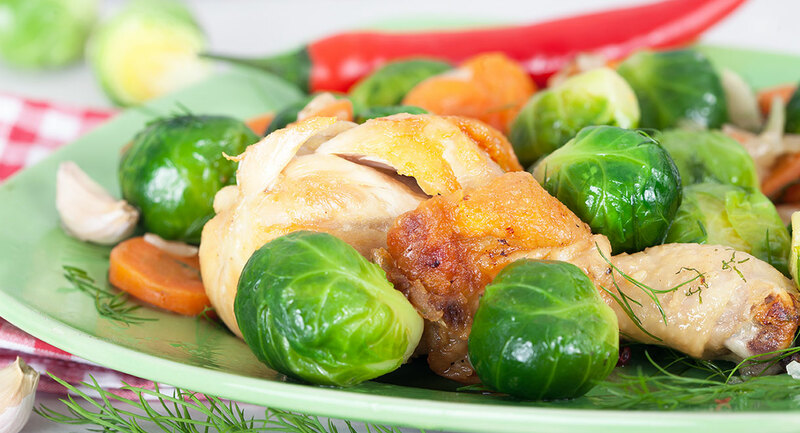 Place all ingredients into an oven proof dish and bake for approximately 30 minutes, or until chicken is well cooked. Did you mean pasteurized ghee? Either 'pastured' or 'pasteurized' ghee makes sense.